From 13 July until 9 October, Alt art space in Istanbul, Turkey presents two video installations by Allora & Calzadilla: The Great Silence (2014) and Apotomé (2013). These two works focus on the roots of signification and reflect upon the sensory universe that lies beyond human grasp. Exploring the boundaries between what “is” and what “is not” the two films consider how that threshold is made perceptible by the “one” who chooses to construct it. The Great Silence (2014), a three-channel video installation, focuses on the world's largest radio telescope, which transmits and captures radio waves to and from the farthest edges of the universe and is home to the SETI database that processes cosmic noise in attempt of finding and decoding possible messages of extraterrestrial intelligence. Located in Esperanza (Hope), Puerto Rico, it is also home to the last members of an endangered species of parrots, Amazona vittata. 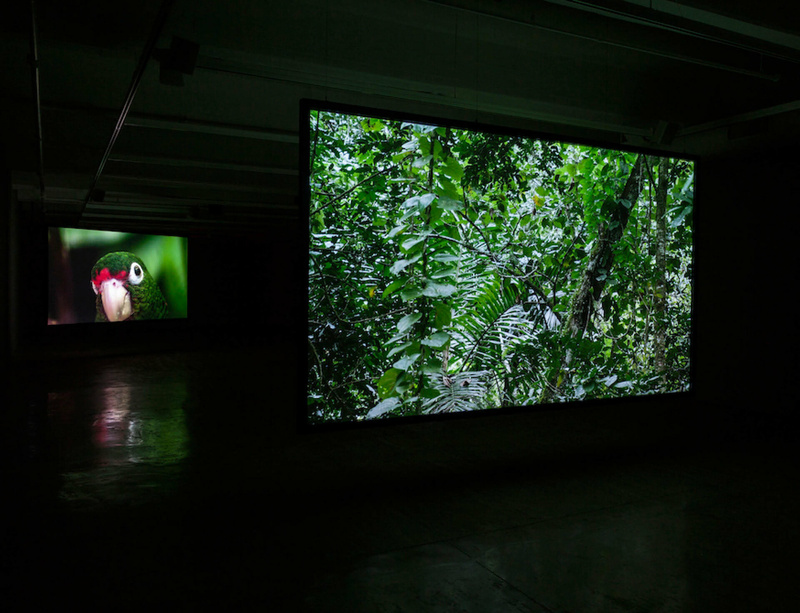 Allora & Calzadilla collaborated with science fiction author Ted Chiang on a subtitled script in the spirit of a fable that ponders the possibilities of communication as well as the irreducible gaps between living, nonliving, human, animal, technological and cosmic actors. The single channel video Apotomé borrows its title from the archaic Greek word referencing a musical interval—literally “what is cut off” in the original Pythagorean definition. In it, the singer Tim Storms, who is credited as having the lowest recorded voice in the world, intonates a subsonic version of a concert played in 1798 for two elephants brought to Paris as spoils of the Napoleonic Wars. The musical experiment was organised by conservatory musicians, who embodied a mix of Enlightenment and Revolutionary ideals, to test if music could be used as a means of communication with animals. Tim Storms sings while walking up and down aisles of taxidermy specimens in the storage room at the Muséum National d’Histoire Naturelle in Paris until he finally arrives at the elephants’ skeletal remains. With his voice reaching octaves so low that animals only as large as elephants can hear it, he recasts a historic attempt of interspecies communication through music, in a register that probes the human threshold between the audible and the sensible.